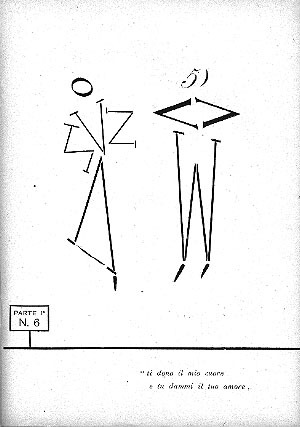 Francesco Cangiullo, Caffè Concerto - Alfabeto a Sorpresa (Café-Chantant - Unexpected Alphabet), 1919. Variety shows, cafés-chantant and operettas together with their characters are preferential subjects of this amazing book, whose every illustration results from a typographic design. The main feature of this work is the emphasis on the suggestions evoked by the shape of each alphabet letter, alone or with others. But, aside from these uncommon and interesting typographic experiments, the author's main theme is the ludic attitude towards all aspects of life. 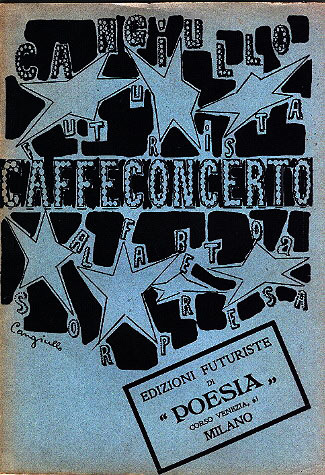 Thus Caffè Concerto is, above all, a theatrical view of life that Cangiullo faced with his Futurist and Dadaist sensibility.